What if everything about earth, history, and humanity itself was a lie? 35,000 years ago, a small group of beings is marooned on the surface of an unforgiving planet teeming with predators. Their futile attempt to survive goes unnoticed in Earth's history, until the afternoon of Saturday, September 15, 2046, when the lunar bases go dark, electrical power through much of North America is interrupted and the first thermonuclear detonation in almost three decades is detected on the planet's surface. This single hour ushers in the unfolding of the terrible truth of humankind's origin, as the lives of eight individuals are thrown together, including a stranger from the future who has come bearing the key to unlock earth's past—from the other side of the galaxy. As evidence mounts that the threat of nuclear destruction is no longer safely relegated to the past, the eight unlikely compatriots struggle to combat a force of evil that has blossomed in the face of human complacency. Has the advent of the nuclear missile and the discovery of the death gene sent our species down an irrevocable route to self-destruction? Is the struggle for good destined to result in a species-wide Pyrrhic victory? As the group careens from the moon's orbit to the Mojave Desert to a secret base deep in the heart of a mountain, only one thing is clear. If Earth is to be granted a second chance, the unlikely cohorts must pull off a Hail Mary of global proportions. The resilient and unpredictable foundation on which the outcome hinges is the one thing they all share—their humanity. Sean T. Smith is a native of Southern California. He graduated CSUN (California State University, Northridge) with a degree in Business Administration. After several years working in the corporate world, he found the structure too rigid and creatively stifling. He decided to take a break and travel the world. It was during this period, while interacting with various people and cultures, that he realized how similar, rather than different, they truly were. That germinated the idea that inspired him to create the universe of his first novel. 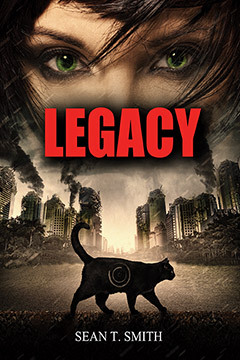 Legacy is the first book in a trilogy of interrelated stories that explore the boundaries of human knowledge, the universe, and its creation.